This DVD looks at the ideas from the previous volume and takes them to a more advanced level. Subjects covered include: "beginners' jazz" and hi-hat timekeeping, building up an ability to play comfortably in rock and jazz styles, advanced phrasing concepts, rolls, rudiments, twin bass pedal and much more! 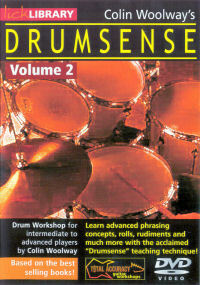 Rudiments, and their contemporary application have never been better explained. The concepts of how simple phrases become rolls, and how paradiddles represent a "gear shift" are explained in detail. The twin pedal section will get anyone started, and help those who already use two pedals, by employing a simple philosophy and moving it on. Please note that this DVD is formatted for the PAL system used in most countries. It will not work in players which will not play PAL discs, most notably in USA and Japan.